Epic Games unveiled its newest "VR experience" at Oculus Connect 2 today: Bullet Train, a first-person shooter demo than makes use of the Oculus Rift and Oculus Touch motion controllers to simulate an elite agent training program inside an ultra-modern train station. As the video shows, the Touch controllers will simulate individual hand movements, enabling separate left and right-handed actions. Players will also be able to teleport, manipulate time—bullet time on the Bullet Train!—and get down-and-dirty with some close-quarters combat. They won't, however, be able to move about freely. As The Verge notes in its in-depth coverage of Bullet Train, teleportation is only possible to specific points in the map, and plans to make the escalator ridable were scrapped after Oculus testers tried it and felt queasy on the way down. 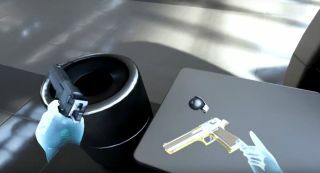 Bullet Train is obviously a demo and not an actual game, but the way it incorporates independent hand movements into the VR experience is impressive, and hints at some potentially very cool implementations to come. It's playable at Oculus Connect 2, and we just happen to have our man Wes on site. With any luck he'll be able to get his hands on it and tell us what he thinks.